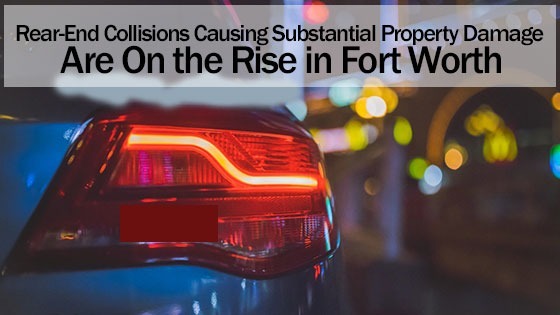 Home » Blog » Rear-End Collisions Causing Substantial Property Damage Are On the Rise in Fort Worth’s Most Dangerous Intersections. Our Fort Worth Car Accident Attorneys Can Help. Rear-End Collisions Causing Substantial Property Damage Are On the Rise in Fort Worth’s Most Dangerous Intersections. Our Fort Worth Car Accident Attorneys Can Help. With about seven million people living in the metropolitan statistical area of Dallas, Fort Worth and Arlington, it seems that just about as many vehicles are on the roadways too. That’s why the frequency of crashes continues to increase every year. Fort Worth had six of the worst intersections with Henderson Street at Weatherford Street nearly doubling the other five locations with 118 crashes and 105 injuries between 2012 and 2015. Of course, most of these accidents involved rear-end collisions. According to the Insurance Information Institute, rear-end collisions lead in the category of types of motor vehicle collisions at 32.4 percent of all accidents. Although only about 6.8 percent of the total accident fatalities in the nation result from rear-end collisions, the number of injuries suffered in these accidents is approaching 600,000 per year. You’ll want to speak with a rear-end collision attorney from our Fort Worth offices if you or a loved one were injured in a rear-end collision. The correlation between the weight and speed of one vehicle that impacts with the rear of a passenger car is a matter of simple physics. That combination of weight and speed will determine how substantial the property damage to the passenger vehicle will be. As weight and speed increase, so does the likelihood of severe injuries or even death. Rarely does a driver or occupant of a passenger car walk away unscathed when its rear bumper is pushed against its back seat. The human spine, shoulders, neck and head can be particularly vulnerable to injury in a rear-end collision. A common soft tissue whiplash injury is going to cause pain and discomfort, but the symptoms from a whiplash injury usually clear up within six weeks. Some other types of injuries might permanently affect a victim though. Those injuries most often affect the brain, spinal cord and central nervous system. They often include traumatic brain, spinal cord and spinal injuries. A person need not suffer a blow to the head in order to suffer a traumatic brain injury. When the human head suddenly accelerates and then decelerates in less than a second after a heavy rear-end impact, the brain crashes against the front and back of the skull. Serious brain tearing and bruising can result, which might not be reversible. A bruised spinal cord is likely to heal, but a torn spinal cord will never heal. A partial tear will render a person a paraplegic. A complete tear of the cord will render him or her a quadriplegic. In either case, care will likely be needed for the rest of the victim’s life. We are able to turn and bend because between our vertebrae, we have spinal discs that act as cushions when we bend, walk or run. Inside of those discs is a gelatinous substance. If a disc herniates, it leaks that substance out, and in turn, that puts pressure on spinal nerves that can result in serious pain and permanent disability. You’ll want to seek immediate medical attention after being injured in any rear-end collision. Don’t give the opposing insurance company any type of a statement. They will only try to use your own words against you. As soon as possible after obtaining medical attention, contact us to arrange for a free consultation and case evaluation with a rear-end collision attorney from Fort Worth offices. We promise to listen to you carefully, answer your questions and advise you of your full range of legal options. Contact us at any of our convenient locations.